A new study has found that Aussie shoppers remain a patriotic bunch with a whopping 89 per cent of respondents agreeing they’d more likely buy an Australian made product. The study by research firm Roy Morgan pitted shoppers views of locally made goods over their cheaper Chinese alternatives. It found 30 per cent of us are likely to buy Chinese made goods based on price, while 48 per cent of respondents were less likely to buy the Chinese variant. The differences were greatest when it came to food. Some 89 per cent of Australians are more likely to purchase locally grown/processed food, compared with just 5 per cent who’d buy food originating in China. Chinese wine is similarly unpopular: only 3 per cent say they’d be more likely to buy wine if it came from China, while 73 per cent are more likely to buy wine if it’s Australian. Interestingly, half of Aussies say they’d buy an Australian-made car (despite all the local car plants closing.) Only nine per cent said they’d consider a Chinese built car; not good news for brands such as Great Wall and Foton. The study also noted “Australian-made clothes, electrical goods, sporting goods are also heavily favoured”. 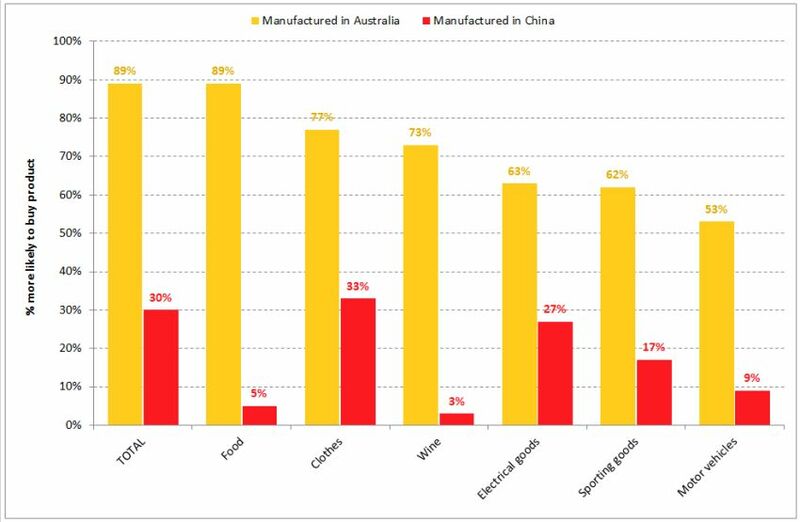 Concern about country of manufacture varies somewhat between age groups, with teenagers aged between 14 and 17 showing the most divergence from the average: 37 per cent are open to Chinese-made products overall, while 82 per cent say they’re more likely to purchase those made in Australia. This slightly elevated inclination to buy Chinese can be seen across the specific product categories too. While this doesn’t mean Aussie teens would choose products made in China over those manufactured in Australia (higher proportions of them still say they’d be more likely to buy goods from each category if they were made here), it certainly indicates a more global outlook to consumption—hardly surprising, given that this group has grown up with online shopping: the ultimate international marketplace. Some 48 per cent of the population are less likely to purchase goods they know are Chinese-made, a reluctance that’s even more widespread among 50-64 year olds (50 per cent) and, less predictably, 18-24 year olds (53 per cent).